Developing a relationship with technology by humanising it. German artist Aaron Scheer’s work bounds together collages, photography, and a painterly technique through the digital realm, expanding what painting can be, or mean in today’s digital age. The production and process itself is an act of art, but nothing compares to the completed projects, some made to solely exist virtually and some created to exist physically, including his “DaNA”, “Virtual Matter”, and “Digital Archeology” series. In between the poles of analogism and digitalism, high and low, on and off, or conscious and unconscious decisions, Sheer’s work is all about process, questioning the idea of the human in technology, and the technological in the human. The artist admits an initial “love-hate relationship with machines”, in which he begs us for deeper consideration of both the human and the machine’s affections. Aaron Scheer (b. 1990, Ahlen, Germany) graduated from a B.Sc. and completed a M.Sc. at HDK – Högskolan för design och konsthantverk, Gothenburg, Sweden. He has previously exhibited with isthisit (London), Contemporary Collective Gallery for Artsy (Berlin), Gothenburg’s International Art and Design Festival (Gothenburg), Off Site Project (London/ Mexico City), Scandale Project (Paris), amongst others. Aaron currently lives and works in Berlin. I’ve been moving to Berlin approx. 2.5 years ago. Berlin was always an option, ever since I fell in love with the art and creative scene there. But there has never been the right time really. After my B.Sc., the time was right. Also, because my girlfriend relocated from Paris to Berlin at that time. Berlin is one of the most flourishing creative metropolises in the world. And one that is still affordable. There is an influx of creative young people with the philosophy to experiment. Berlin radiates an almost irresistible entrepreneurial energy. A great flow, and I wanted to be part of that flow. My work became more consistent, and at the same time more experimental. A paradox, I know. Berlin helped me to be more conscious about the topics that I address in my work, as well as a certain aesthetic I am trying to achieve: all influenced by the digital age we’re living in. Parallel, I started to expand my work to other mediums and techniques, such as video and installation. My Master studies helped me a lot in this process, where I could have the safe space to both experiment (do) and reflect (think). Absolutely. Well, it is not so much the city itself, but more the people who play such an important role. There are so many interesting young artists and creative people here, all with the desire to shape contemporary life. I’m trying to meet a lot of other artists, as well as curators and gallerists. And try to attend as many exhibitions as possible. Berlin is very inspiring. But can be exhausting as well. There are so many things going on, things to attend. You can get caught up. You need to find time for your own work. But I wouldn’t want to miss it. I’m actually planning to incorporate the city with its impressions on me in one of my next series. I had the idea for quite some time. Let’s see where this goes. Stay tuned! Yeah, that’s a good question. I always tend to be someone who doesn’t really differ between work and life. I’m very driven. Sometimes I work a bit too much. I always have a lot of different projects at the same time, not only art projects. As I’m working a lot online, it’s quite convenient to manage everything from home. It enables me to have different things going, while still trying to manage some kind of private life. I love “Netflix and chill” evenings, haha. My usual day would start with Instagram (and end with it), checking emails, talking to people, listening to music, drinking tea, and working on projects. And yes, besides ,I do laundry and cook. Music is very important when I work on my art projects. It helps to get me in some kind of creative flow. And then it just starts. A lot with my computer. Collecting material, collaging things, abstracting things; simply testing things out. My work is really a process, it’s core. Whenever I get some kind of thought, I simply try it out, experiment around, and just do. I go from there. Sometimes till the middle of the night. I remember being in Berlin with my father, who was a painter as well, visiting Hamburger Bahnhof; one of the major art institutions in Berlin. I was approx. 17 or 18 years old. I’ve been visiting other institutions before, basically since I can think and walk, but this one somehow left a marking memory. I think it was a combination of this pulsating city, it’s inspiring people, and a lot of good inspiring art. I especially remember some new media and collage contemporary pieces that really stuck with me. Haven’t seen such pieces before. In addition to works from Neuman, or Beuys, it was a fascinating experience. Another more recent experience was the acquisition of two of my pieces from the gallery director and founder of Galerie Kornfeld and 68 Projects. Among, my first large-scale piece measuring approx. 170 x 120 cm. 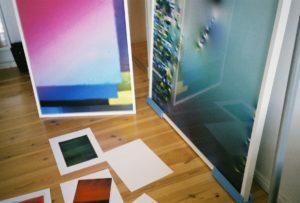 I was able to produce these works in museum quality, with partners who also work with artists, such as Julius von Bismarck or Stefan Heyne. Experiencing this with 27, was a memory that will accompany me for quite some time, I guess. Berlin is indeed a very prestigious international art city. Especially when it comes to artists living in Berlin. Feels like every major artist has a studio in Berlin; or NY, or London. I am in contact with a few artists and art collectives here in Berlin. Also, with one or the other gallery or curator. Nevertheless, I am absolutely open towards being involved in other scenes as well. In fact, I like having international projects. Instagram is fuelling my interconnectedness to the international art scene. London is somehow a place, where my work gets some attention. Don’t really know why, but it’s interesting. Other than that, I would love to get more in contact with the scene in NY. Shanghai and Beijing start to have really interesting art scenes as well. Something for the future. I am aware that your dad used to be an abstract expressionist painter. In this aspect, would you agree in saying that your practice has very much a “painterly” aspect attached to it? For sure. Ralf Hanselle, art critic from Berlin, wrote a text about my work titled “Borderlines – Aaron Scheer and the painterly in the digital modernity”. I think all my pieces so far have a painterly quality to it. I come from painting with acrylic, oil, or spray paint. That’s how I started off. My father, as you’ve been mentioning, was a painter. 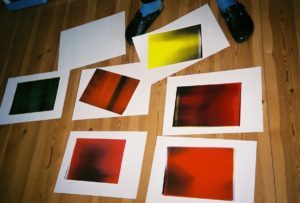 My first influences were in painting, such as Katharina Grosse. 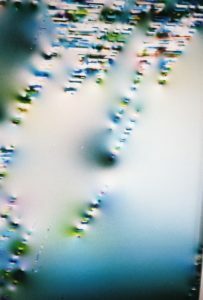 But I very soon developed an interest in other bodies of works, such as Wolfgang Tillmans or Isa Genzken. I started to experiment around with collages, or photography. It soon became apparent that I would combine different techniques and mediums. The digital realm enabled me to combine everything. That’s where I am now. Nevertheless, my heart is in painting. But I try to expand what painting can be, or mean. 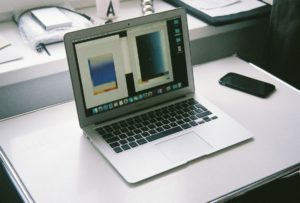 There are certain dualities visible in your work, such as the mix between high and low tech, your combination of the online and the offline, and the play between conscious and unconscious decisions. Can you clarify your views on these oppositions? Difficult question. I think that tension is an important factor of what constitutes a good piece of art. It generates a certain interestingness, as tensions and even paradoxes result in ambiguity. It poses questions, rather than giving answers. Duality is a very interesting concept in creativity. Integrating what doesn’t seem to fit in the first place creates novelty, as the human mind is not really conditioned to deal with such ambiguity. Hence, not a lot of people try to integrate, or even embrace ambiguity. So, if you do, something new, innovative can happen. I embrace this principle in my work. High, low; on, off; conscious and unconscious are just logical consequences of what I’m experimenting with in my work. It developed along with time. Can’t really explain how it came into being. It’s all a process. I am very interested in the variety of both the physical and the virtual series you showed us at your studio in Berlin. From “DaNA” to “Virtual Matter” or “Digital Archeology”, can you share the concepts behind each of these series with us? Sure. Let’s start off with my DaNA series. It’s an acronym standing for “defining a new aesthetic”. At the same time, it emphasises “DNA”. I wanted to work with the topic of what constitutes the DNA of our digital age. And, the DNA of my work. Sharp meets blurry, squared forms meet organic ones, micro paintings meet the macro composition, and so forth. The series came into existence after having experienced with a wide range of techniques and styles. The series was somehow a synthesis of all former. The overall idea in my Virtual Matter series is to “up-cycle” lost and found material from the virtual space, in ways that it gives back value to digital (virtual) matter. In a world where digital material, especially photos, are available 24/7, instantly and most of the times for free, the medium loses its value. On the other hand, access is being granted, which can be potentially seen as a way of democratising. The essential question for me here is to find the golden nuggets in the overload of images: on my phone, my laptop, and the internet. To consciously discover material in the virtual space that is been overlooked by fast digital consumption in the age of Instagram and co.
My Digital Archeology pieces have certain architectural elements to them. A bit like the majestic architecture that you’ve been mentioning in regard to Berlin. But a corrupted, distorted digital one. The squared color blocks remind the viewer of ruins of ancient settlements, being discovered in archeological excavations. Maybe one day, my pieces will be witness of the transition between physical reality and virtual, or blended reality. Or not. Machines are central in your practice. From using them as a tool to make your works, to exploring ideas in relation to “the souls of the machines”. What fascinates you about these devices? Are you interested in conceptually becoming a machine? Ok, deep. I have a love-hate relationship with machines. On the one hand, they’re fascinating me, on the other frightening me. I never really had an affection for machines, as they didn’t really play a big role at home. Human affection was always much more important than technology or mechanics. But, this is where my fascination is rooted as well. I could never really understand technology in depth, but wanted to develop a relationship. The easiest to develop a relationship with tech for me was to humanize it. And I think art is at core a very human, maybe the most human product. Machines are made to perfectly perform. Errors need to be eliminated. Constant performance, literally 24/7 is a given. So I thought, what if I start manipulating machines and force errors? Do machines then become more human? Do machines have a soul? Do they interpret what we dictate them to do? Are machines creative, and can they add something to my work as an artist? Parallel, I started to reflect upon my work ethic, highly influenced by a very performance-driven environment that I was embedded in, basically my whole life. And I could see that I, and many others around me, were becoming the machines. Made to perform, made for perfection. A logical consequence of a system that values performance over everything else, and where humans compete with machines, as a consequence. In that sense, all of us are somehow machines, already; even without chips being implanted into our brains. Mechanical painting gestures, e.g. in my “Analog vs. Digital” pieces present this investigation. 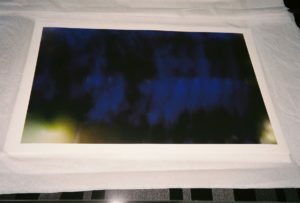 My “Printer Painting” series directly relates to my attempt to discover human aspects in machines. On a more general level, production and process play a crucial role in my work. Both aspects are connected to the question of the human in technology, and the technological in the human. I am intrigued with the use of light installations, shadows and photography within your practice. Would you acknowledge that in relation to this medium, that the documentation of the work itself can become part of the work? For sure. 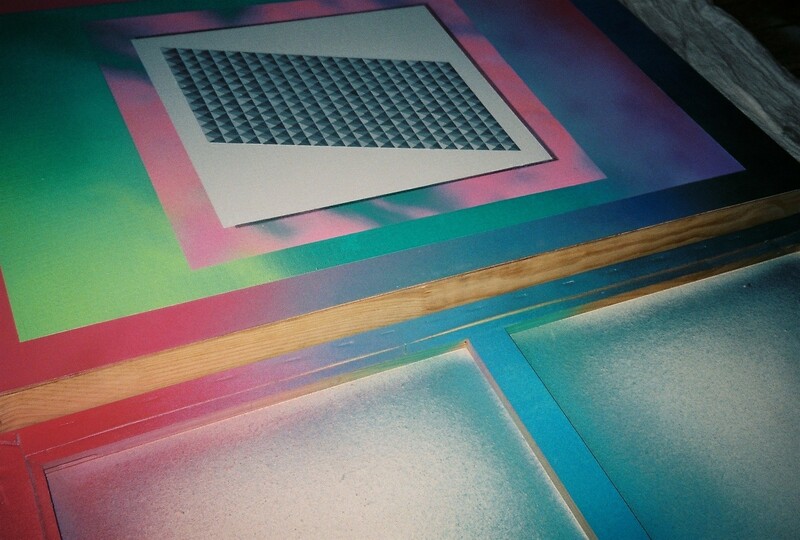 I recently experimented with installations in spaces beyond the typical “White Cube” setting. I wanted to see how my digital pieces can be arranged in a way that they blend into their environment. On the other hand, I wanted to see how the space and its objects can be used in a painterly way, so that the environment becomes part of the piece. Photography is a very powerful tool to capture and manipulate what can be seen and experienced. It enables to create compositions and focus. In that sense, the photographs become the pieces themselves, in addition to the installations in the space. Photography escapes the purpose of mere documentation and becomes its very own art form. I was working on the project with a Mexican designer, activist and photographer, Ana Paula Lafaire, and I will use the photographs for another show with Off Site Project. So stay tuned!